Fantomex is an anti-hero in the Marvel Universe. He is known for being a member of the Weapon X program that created Wolverine. He is recruited by Wolverine to serve on X-Force. Fantomex Cosplay - The Full X-Force assembles! Fantomex is one of the crazier characters in Marvel. He is actually not a real person but a artificial one. Fantomex was created as part of the Weapon Plus program as a super sentinel to hunt down and kill mutants. Fantomex is a descendant of techno-organice race that had sentinel nano technology intertwined with their cells. This advanced evolution of life occurred in a facility called the World. The World was a sub dimensional space that uses artificial time. Using artificial time the Weapons Plus program could make events pass at a faster pace than in normal Earth time or could freeze them entirely to a halt.. This allowed Weapons Plus to develop highly evolved subspecies in days as opposed to millions of years. Fantomex's mother was part of the techno organic subspecies of the world and was fertilized by special Sentinel nano machines that resulted in Fantomex. Fantomex is not actually French but he claims to have been raised in a virtual France and has modeled himself after a Frenchmen. He also fashions himself as a womanizer and a thief and uses his powers to make that goal a reality. He often uses the name Jean Phillipe which was a name he himself chose. Fantomex is considered to be Weapon XIII of the weapon plus program. Like Wolverine he rebelled against the program and has sought to eradicate its dangerous creations and the programs creator John Sublime. He has often teamed up with Wolverine in attempts to hunt down and destroy the Weapon Plus program. An accident in the Chunnel releases a dangerous mutant who begins to take over people's minds. Around this time Fantomex shows up at Xavier's doorstep with bullet wounds, he claims to be a famous French thief with the mutant power of misdirection. Xavier and Jean Grey are disturbed that they are unable to read Fantomex's mind but decide to take him at his word and give him sanctuary. Fantomex is able to enter a trance like state and performs surgury on himself. Fantomex reveals that he has a space ship called EVA, he and Xavier take off to battle the dangerous mutant in the Chunnel. As they battle the mutant they learn that it is Weapon XII. Upon Weapon XII's defeat they learn that there are in fact to canisters that contained Weapon Plus mutants, one contained the now dead Weapon XII and the other was empty. 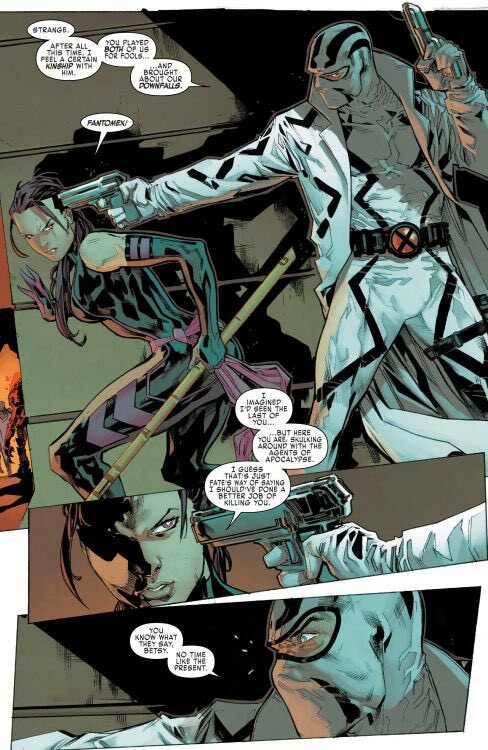 Fantomex is revealed to be this Weapon XIII. Jean Grey allows Fantomex to leave when he saws his only desire is to become a famous theif, and that he is no man's soldier. Fantomex's space ship EVA is later revealed to be an actual part of Fantomex. She is called an external nervous system. In some unknown fashion EVA and Fantomex have a symbiotic relationship. Fantomex joins Wolverine's new X-Force team in attempt to assassinate a new Apocalypse. When the team learns that this Apocalypse is still an innocent child they hesitate on what they should do. Fantomex does not hesitate and shoots the child version of Apocalypse killing him. It is later revealed that Fantomex has taken control of the World and it is raising a new version of Apocalypse. It seems Fantomex's hope is to raise an Apocalypse in a good virtual life to see if he can become a hero. He later starts a relationship with fellow X-Force member Psyloch. The two are attacked by Captain Britain who believe Fantomex is a menace that must be eliminated. Psyloche and Fantomex fight their way free and defeat the older brother of Captain Britain, a corrupt superhuman called the Goat. Fantomex is later killed by the villain called the Skinless Man who cuts out his heart. EVA survives and attempts to clone him but the cloning process is imperfect due to the complexity of Fantomex's three brains. The three brains each become their own clone. One clone is evil and calls himself Jean Phillipe or Weapon XIII, one brain becomes a female called "Cluster" and the third is mischievous and goes by Fantomex. Fantomex has the power of misdirection which is actually a reality warping illusion ability. His illusions are extremely powerful and he is able to use them to cause a variety of effects. 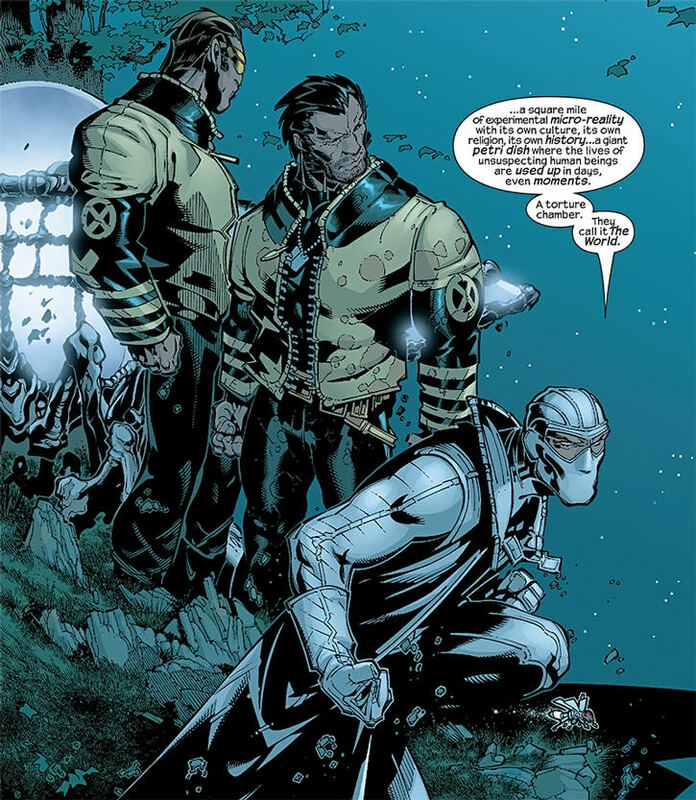 Fantomex has a unique physiology that includes three brains. This allows to survive a head shot as the other brains can take over. It also allows him multitask on numerous problems at once. Highly skilled marksman, stealth, thief, illusionist, psychological manipulation, and reading people. EVA is a separate mind that is connected to Fantomex. EVA is generally depicted as an advanced space ship but has taken on humanoid form at times. EVA is called Fantomex's exterior nervous system. Fantomex can see through her, feel her injuries, and direct her through his telepathic link. Fantomex also takes control of the highly advanced inter-dimensional region known as the World. In the World Fantomex can run experiments similar to those that created himself.